Rich Hanenburg began building the boat in the garage attached to his home in Puyallup, Washington, in November 1998. Using patterns supplied by the designer, he cut and assembled the wood frames for a 28-foot tug yacht. In February 1999, he and his wife, Jackie, and family and friends had a barn raising in the yard. They erected a temporary, fabric-covered shelter and moved in a 100,000- Btu kerosene-fired heater, and Rich began to handle the larger, heavier timbers he needed to frame the hull. Rich works an early shift as a jet-engine mechanic for Alaska Airlines at Seattle-Tacoma International Airport, a job he&apos;s had for 40 years. Nearly every afternoon for more than six years, he headed south for home and the little boat in the barn. There were challenges and problems to work out, but he says he never became discouraged, never lost his enthusiasm. His record keeping is as meticulous as his woodworking. By April 2005, when he and Jackie launched the jaunty little yacht, he had labored 5,500 hours spread over 1,506 days, over the course of 6-1/2 years of working afternoons, evenings, and weekends (but not vacations, usually), his records show. Building the boat consumed more than 600 board feet of lumber, 15,000 bronze and stainless fasteners, 80 yards of 6-ounce fiberglass cloth, 50 gallons of epoxy, and 18 gallons of paint and varnish. They spent 200 hours prepping and painting the boat, giving her green bulwarks and a white hull and deckhouse. The window trim is varnished mahogany. The hours recorded by Rich do not include time spent looking for good boatbuilding wood-- Honduras mahogany (he didn&apos;t find any, so he substituted African mahogany), vertical-grain fir, oak, and sheets of marine-grade plywood-- or chasing after elusive parts. Ask any two designers to draw plans for a 28-foot tug yacht, and the results probably will be similar. That&apos;s why Rich&apos;s boat looks familiar. Indeed, the boat, designed by Ken Hankinson of Hayden Lake, Idaho, resembles a Nordic Tug. The first Nordic, you may remember, was a 26-footer that was introduced to the boating public in 1980 and was an instant success. Rich recalls that Hankinson once overheard others commenting on the similarity of his boat and the Nordic Tugs. His response was that his boat, which he called Nordcoaster, did look something like the more famous tug yacht but that his was better. Hankinson designed smaller boats to be built by owners, often in their backyards. He provided drawings for Rich, along with patterns for frames and a list of needed materials. Nordcoaster, as designed, is a 27-foot boat. Rich added a foot and gained just a little more interior space. 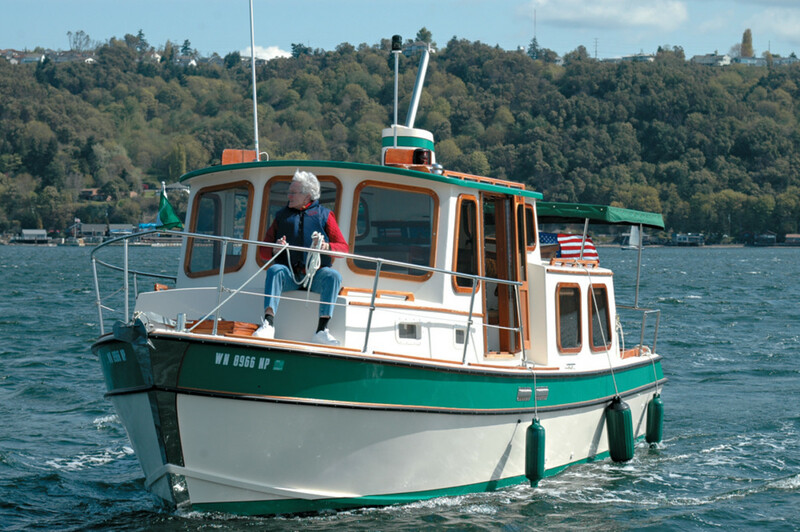 In September 2005, friends and family gathered for the christening of the boat, and her builders took an 11- mile maiden voyage to her permanent moorage in the Tyee Marina on the north shore of Commencement Bay in Tacoma. Some will call her cute. That&apos;s OK. Others will describe her as perky. And that&apos;s fine. I think she&apos;s a little gem. The boat Rich and Jackie named HoHum (not out of boredom, but because, to them, the word implies a leisurely pace) was not the first for the jet mechanic. It was the 10th and, by far, the largest boat he has built. The biggest of the earlier boats was a 21-foot sailing dory. Rich brought other valuable experience to the project, so this story is not about someone without skills or knowledge bumbling along and building something that barely resembles a boat. "I built my first boat while I was in high school," he says. "I finished it after we got married." Another recent project was a 10-foot Norwegian pram. "I love to build dinghies," he adds. Some of his skills are genetic, or at least well remembered. His father ran tugboats and commercial fishing boats. "He also built a lot of boats, small fishing boats. And my great-grandfather was a wagon maker. "I just love wood. I love to work with it." Rich&apos;s work on turbines has given him skills in handling tools and machinery, and that knowledge transferred easily from the airport hangar to working on HoHum&apos;s 70hp Isuzu diesel in the Hanenburgs&apos; backyard boat barn. Something else that contributed to his packet of skills: He and Jackie were sailors for 10 years, cruising aboard a 27-foot Catalina, but gave it up when sailing became difficult for a guy with a stiff neck. Life aboard the Catalina was like being a cave dweller, they say. There weren&apos;t many portlights, and they were small, and the interior was dark. They were tired of that, too. So Rich and Jackie began thinking power. Rich saw drawings of the Nordcoaster in a Hankinson catalog and exclaimed, "That&apos;s it!" Finally, they sold the Catalina to finance the backyard boat that became HoHum. It&apos;s not surprising they fell for a boat with a dozen windows, each with a full view of the sea. As is proper for a wood boat, Rich built HoHum upside down. After the frames were attached to the keel, he began sheathing the hull with plywood-- two layers of three-eighths-inch ply on the bottom and five-eighthsinch on the cabin side and top. The plywood was covered with fiberglass cloth and six coats of epoxy. He added extra plies of cloth on curves and where the keel joins the hull. To finish a wood boat, it must be righted. Rich built a cradle that would roll, called on sons and friends, and brought in a truck-mounted crane that could lift 10 tons. And they rolled HoHum over and set her upright on her keel. Because she&apos;s 28 feet long, a tour of HoHum doesn&apos;t take long. The place to start is in the cockpit, an easy step from the mooring float. With a canvas cover, the cockpit could be the social center of the boat-- although the galley may be its equal. The cockpit has space for chairs, and the cover provides protection from the weather. Step down and into the saloon/galley. The galley counter, with a propane stove (with an oven) and a stainless sink, is to port. To help keep the boat simple, Rich and Jackie decided not to install a galley refrigerator. Instead, they use a large ice chest. On the opposite side is a dinette that seats four and will sleep two. Our tour stalled here while Jackie poured coffee and served homemade cookies. Later, she proved galley efficiency by quickly building sandwiches at the counter, while Rich and I lounged at the settee. Big windows flooded the space with sunlight. This is far from a sailboat cave. The settee opens to a generous berth. Ship&apos;s batteries (a Group 31 for starting and two 6-volt batteries for house service) are stored beneath one seat. A couple steps lead up to the pilothouse, which has doors on both sides and a helm seat for two. Again, big windows provide excellent visibility. The helm is simple: the wheel (she has hydraulic steering), a compass, the bilge pump switch, the usual engine gauges, and a navigation center in the process of being installed. The doors lead to side decks that carry forward to the bow. A pipe railing provides security. A skinny little side deck (maybe a hand&apos;s width in size) runs aft, but, even with a grabrail on top of the deckhouse, it&apos;s no place to be while under way. The large V-berth is tucked into the bow area, down a couple of steps from the pilothouse. There&apos;s some storage and a head. Remembering agonizing problems with the marine toilet on their sailboat, Rich installed a portable toilet in the head. There is space for the real thing, however. The mahogany trim and white-painted wainscoting are well done and in character for a boat that reminds us of older tugs and workboats. If the windows slid up and down, as they did in workboats and yachts decades ago, the illusion would be perfect. Fortunately, HoHum has fixed windows. 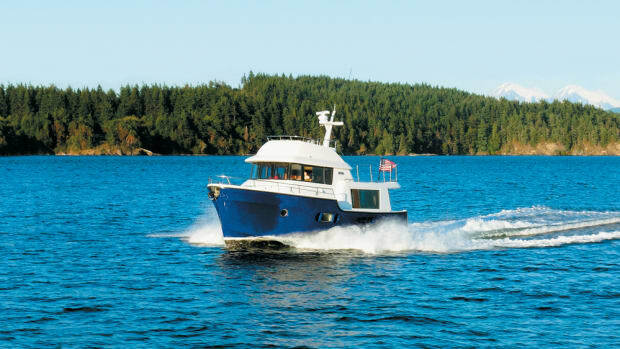 Heat comes from a portable electric heater, which can be moved from the galley to the pilothouse or the sleeping area, and a Dickenson bulkhead-mounted diesel heater in the pilothouse. Rich and Jackie took hundreds of pictures during the construction of HoHum and saved many of them in an album, adding text describing the work pictured and when it was done. One picture that I remember well--because I can&apos;t imagine ever being able to do it-- showed Rich setting up equipment to bore a hole through the keel for the propeller shaft. It was a long cut through laminated Douglas fir, and the angle of the bore and its dimensions were critical, but he says it came out just right. With the hole bored and the propeller shaft installed, Rich lowered the Isuzu into the engine room. "They came together perfectly," he says, clapping his hands to illustrate the precise fit of the shaft and engine. The proof for me came when we took HoHum for a ride and she rode smoothly and quietly through the sea. Another set of photos focused on Rich cutting window and door openings in the deckhouse. The first went so well that he couldn&apos;t stop until he had cut them all in one long day of work. HoHum is a simple boat, without the tangle of complex systems found on large production yachts. Even so, Rich says he attempted to meet recommendations of the American Boat and Yacht Council (ABYC), as did his good friend, Paul Martinson, who did all of the electrical work on the boat. Additional help came from Steve D&apos;Antonio, PMM&apos;s technical editor, through his many articles on boat systems. "Every time I had a question or problem, I&apos;d open the magazine, and there was a story by Steve explaining it," he says. Steve&apos;s articles about propellers and shafting were particularly helpful, he adds. Rich did all the interior carpentry work, building the large convertible settee and galley in the saloon, the helm station in the pilothouse, and the berth in the bow. He used mahogany generously, for trim, furniture, and decking, and white-painted wainscoting in the pilothouse and saloon. A friend gave Rich some old library shelving. He milled the mahogany and built 14 laminated, curving roof beams. The interior is timeless and "yachty." The interior mahogany was finished with a Minwax polyurethane semigloss varnish. "I used foam brushes," he says. "We were gonna name her Miniwood for a while," he added. Minwax usually is not mentioned in discussions of yacht finishing, but its varnish looks perfect on HoHum. Hankinson designed sliding doors for the pilothouse. Rich figured they would take up too much space on the narrow side decks and built folding doors that don&apos;t intrude on the deck. To reach the engine room, we lifted two hatch covers in the pilothouse. Because it&apos;s a small pilothouse, Rich stows the covers in the galley. The four-cylinder Isuzu fills up most of the space, but there is room on the port side for someone to drop in (carefully, because it&apos;s a long step) to service the engine. Rich chose a Hurth reduction gear, which turns a 1-3/8-inch propeller shaft and an 18-inch-by- 14-inch propeller. Dual Racor fuel filters are a particularly wise investment for a single-engine boat, and Rich mounted his on the engine room bulkhead. Following Isuzu recommendations, Rich installed keel cooling for the engine. Rich reports the engine running at 1800 rpm will drive the boat at 6.7 knots. At 2100 rpm, the speed climbs to 7.4 knots. At wide-open throttle (2600 rpm), she&apos;ll do 9 knots. The engine room is well insulated. At cruise speed, I measured 73/74 decibels (A scale) at the helm. The engine noise certainly is obvious, but normal conversation is possible. Hankinson specified a 100-gallon fuel tank. Rich installed a 60-gallon aluminum tank. "I like to go through fuel, rather than store it," he explains. Even the small tank will carry HoHum many miles. Rich says she burns less than 1gph at 1800 rpm (6.7 knots) and 1.2gph at 2400 rpm (8.5 knots). Doesn&apos;t much matter if diesel is $3-plus per gallon, does it? The boat carries 25 gallons of water in a plastic tank. Knowing I wanted to take pictures of HoHum under way, Rich persuaded a friend, Helmut Kellermann, to make his 36-foot Catalina available. Neither boat has a user-friendly deck (there&apos;s just not much space for big feet), and I was impressed when Rich and Jackie and Helmut and his crew donned inflatable PFDs when they went on deck to handle lines. Helmut stopped his sailboat in the middle of Commencement Bay, with snowy Olympic Mountains to the west and equally snowy Cascades to the east--all under a typical Northwest blue sky. I had asked Rich to swoop in on the Catalina, coming closer than he normally would for the sake of dramatic digitals. At 7 knots, HoHum kicked up a small bow wave and not much of a stern wave. All together, her wake is no threat. Next, I needed to get aboard HoHum. I suggested a transfer at sea, something neither had tried before. But they were willing. Helmut lowered fenders. Jackie and Rich did the same. The wind was blowing about 15 knots, and the sailboat pointed easily into it. Rich, who confesses he&apos;s still learning that a powerboat handles differently than a sailboat, came in upwind of us and stopped neatly and easily alongside. Rich steered the tug yacht out past Dash Point and into southern Puget Sound. As we cleared the point, the northwest wind began gusting to 20 knots (my guess), and a 2-foot chop developed. He handed me the wheel, and I turned into the wind. Although some small boats would go into a hobby-horse routine under such conditions, HoHum just kept charging along without much commotion. We did get spray on the windscreen, and that created some visibility problems because Rich hadn&apos;t yet installed window wipers. "What&apos;s going to happen when I put the wind on the beam?" I asked. "Let&apos;s find out," Rich said. I put HoHum into the trough and readied myself for some rolling. However, her hull shape and hard chine aft squelched any impulse to roll. The boat rose as a sea hit her on the beam and then settled back down as the wave moved on by. Bigger seas might change the dynamics and create roll, but in that wind and sea, she ran as straight and level as a big yacht with stabilizers. I did some hard turns, and HoHum refused to lean. Straight and level clearly is her thing. "I learned a lot building the boat, and I can fix it myself," Rich said as the boat turned toward her marina. As his knowledge grew, he was tempted to make changes. "It was hard not to redo some things." There was a little jesting about his next boat, perhaps something larger. "I really enjoyed the process, but I don&apos;t think I could do it again," Rich said. "The worst was when she was launched and I thought, what&apos;s there to do now?" Well, he seems to find things to do. Just recently, he built and installed the canvas-and-stainless dodger over the cockpit to provide weather protection. He and Jackie learned quickly that a cutlery drawer was awkwardly placed, so he designed and built a new one that slides unobtrusively under the galley table. He was working on the installation of a Raymarine radar and navigation system, but was waiting for parts. And, as all owners of boats with varnished brightwork know, brightwork always is in need of attention. Rich says he spent $55,000 building HoHum. When a surveyor checked out the boat for insurance, he valued her at $125,000 and praised the quality of his work, Rich says. That sounds great. But don&apos;t forget that Rich donated 5,500 hours of his time. He was doing something he loved, so he didn&apos;t assign a value to his labor-- although it was worth a lot. Clearly, Rich was the craftsman. But he refuses to accept a lot of applause, preferring to praise Jackie for her support and confidence. "She put up with a lot," he says. "She paid the bills." Four grandchildren were born into the family while HoHum was under construction. Now Rich has a use for all that nice scrap mahogany, fir, and oak. He&apos;s building toy tugs for the kids.